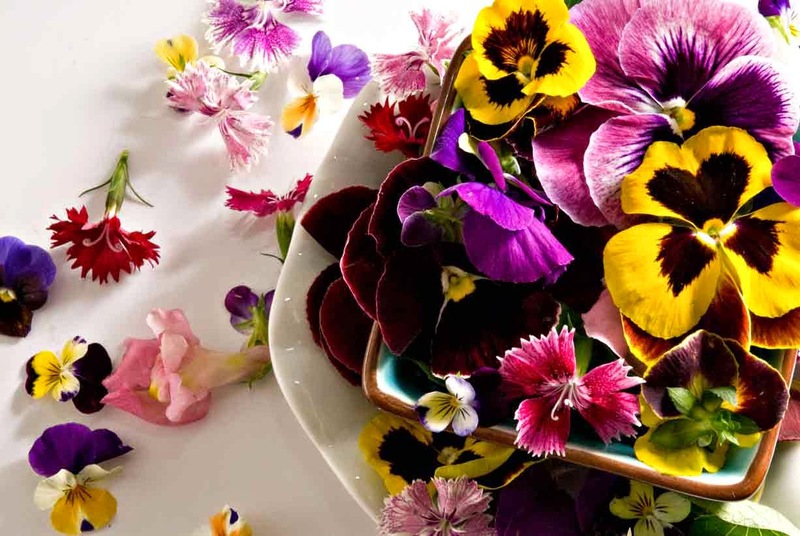 There are plenty of ways to preserve the delicate beauty of flowers. One of them is by coating them in sugar. This procedure not only keeps the delicacy and scent of the flowers’ blossoms and leaves but also makes them eatable and what is more – they actually become very delicious. Sugar coated flowers are used as a decoration of cakes and other types of desserts as well as some spicy meals. There are two ways of coating flowers with sugar. The first one is by using gum Arabic (also known as acacia gum) and the second one is with the help of egg white. 1. With gum Arabic – it is a natural gum that is obtained from acacia tree (where it has taken its name from). Blossoms and leaves that are sugar coated with the help of gum Arabic last longer, they can be preserved for about a couple of months. Here is a quick guide on how to coat with sugar your flowers with the help of gum Arabic. First, fill a quarter glass of water and then put on a water bath (also known as bain-marie). Put 12 grammes of gum Arabic into the water and constantly stir. When the acacia gum is completely dissolved in the water, take the container away from the fire and wait until it cools down. While the mixture of water and gun Arabic is getting cool you can prepare the syrup. Pour a quarter glass of water onto a hundred grammes of sugar, put it on fire and heat it until its temperature reaches 80 degrees Celsius and then cool it. After the two mixtures are cool enough, use a tiny brush on all sides of the flower blossom or leaves to apply first the mixture with the gum Arabica and then, the sugar syrup. To finish the procedure, spread refined sugar all over the flower surface. It would be even better if you use a sieve to spread the sugar through it. Put the flowers on a parchment paper and wait until they get completely dry. 2. Sugar coating with egg white – flowers, coated with egg white look more beautiful but they cannot last too long, they can be preserved for no longer than five days. Here is the technique on how to sugar coat flowers using egg white. First of all, beat the egg white until it becomes thick foam. Then apply it with a brush on all sides of the flower blossoms and leaves. Then spread refined sugar all over them, place them on a foil and bake it in a low heated stove for two hours. When they are ready, apply a tiny layer of egg white beaten with sugar all over them. 3. Sugar coating is not a difficult thing but you should remember one very important rule here – you should sugar coat only innoxious, non-toxic and non-bitter blossoms and leaves. The blossoms should be blooming however, not in a latest stage and not too big in order to be well placed in the stove and to be evenly baked. Roses are one of the most popular flowers when it comes to sugar coating, however, you can also try the blossoms of the sour cherry, apple, pear and white acacia. Want to share something ?? just leave your comments below. Christine is a dedicated writer and blogger who is an organic gardening and landscaping specialist . She says that nature is her biggest inspiration source and its beauty motivates her to keep writing. Presently Christine writes mostly about household cleaning and maintenance. But her latest article is about preserving flowers fresh for longer time.